Anyone who has any professional dealings in the blues world knows that you're not in it for the money. Musicians, club owners, and independent record companies generally are doing blues for the love of the music, and not for the almighty dollar. That's apparently why there have been so many fine independent labels, such as Severn and Fedora, crop up in the past few years. Now there's a new kid on the block ... Mocombo Records, based in North Hollywood, California. 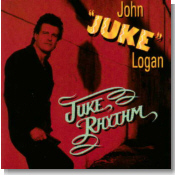 The first three releases on Mocombo are excellent, with the top choice being Juke Rhythm from longtime L.A. harmonica player and bandleader John "Juke" Logan. As I remembered from his excellent CD on Razor & Tie from about five years ago, Logan is not content to play straight eight-bar blues. His music can be pretty darn quirky, and it's always fun. Los Lobos cats David Hidalgo and Conrad Lozano guest on the raw blues "Comb The Streets," featuring incredible fuzzy guitar by Hidalgo. For more of a snaky Tom Waits sound, be sure to check out the slow blues of "Lone Wolf," with great marimba-vibe playing and chromatic harmonica from Logan. This guy also has a knack for inserting blues-related rap lyrics into a song on many of his albums. Here, Logan raps about the blues being "...the soundtrack to reality..." on "Da' Blues Hip Hop," with fantastic Albert Collins-style guitar from Rick Vito. Logan and the band even outdo James Brown on their own theme "The Real Feel (JRB Theme), Parts 1 & 2," with Logan's harmonica replacing the Maceo Parker sax parts. Don't miss this CD ... it'll certainly rank in my top 10 at the end of the year. Another classic L.A. blues band, and one that doesn't get out on the road nearly often enough, is the Delgado Brothers. 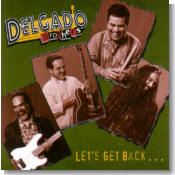 On Let's Get Back ..., the Delgados mix their hometown East L.A. Latin-flavored blues sound with a flavor of New Orleans, especially evident on the opening cut "Come With Me Baby (Can't Go Wrong)." Joe Delgado is one of the best unknown guitarists around, and he gets to show off on the catchy blues "No Regrets" and his own rumba tune "Somethin' About My Baby." If a slow blues is your thing, then you'll really enjoy another Delgado original "If I Don't Get Home." Let's Get Back ... will show the blues word that the Delgado Brothers are back. Be sure to catch them if they come to your town. John "Juke" Logan & Doug MacLeod's Live As It Gets is a long-awaited recorded collaboration by two of Southern California's finest veteran bluesmen who have been playing live together for years. Recorded at B. B. King's in Los Angeles, this "country comes to the city," foot-stompin' live set is one of the best acoustic blues albums of the year. All but one of this CD's tunes are originals, written primarily by MacLeod. Longtime session man/bandleader John Logan's harp playing and singing are about as down in the Delta as you can find. Coupled with Doug MacLeod's six-string picking and husky vocals, this duo is very reminiscent of Sonny Terry & Brownie McGhee. What makes this CD so thoroughly enjoyable, besides the outstanding performance, is the continuously flowing chemistry between these two distinctive talents. They aren't afraid to let it all hang out. These guys love playing together and it shows! Don't miss this one, you'll be sorry if you do!